While this dish is included in other dishes of mine, I have added this separately for those that would like to just make this as a side dish. Perfect for the fall or anytime really 🙂 Super simple, and very healthy and yummy. This would also make for a great filling in stuffed dishes like peppers, wraps etc. Additionally, you can make this as a holiday sweet side by adding ½ tsp of cinnamon and a sweetener of your choice. We are going to steam the squash, so before you prepare it, set up your water and steamer and bring to a boil. Wet a paper towel, squeeze out the extra water and place on your cutting board. This will help the squash from sliding around as you peel it. Cut the ends off the squash and using a peeler, remove the skin. Carefully slice in half long ways. Use a metal spoon and scoop out the seeds. Lay the squash cut side down and carefully cut lengthwise into 1” wide slices. Cut the slices into 1” pieces. These smaller pieces will allow the squash to steam quicker and more evenly. Steam for 12 to 15 minutes. 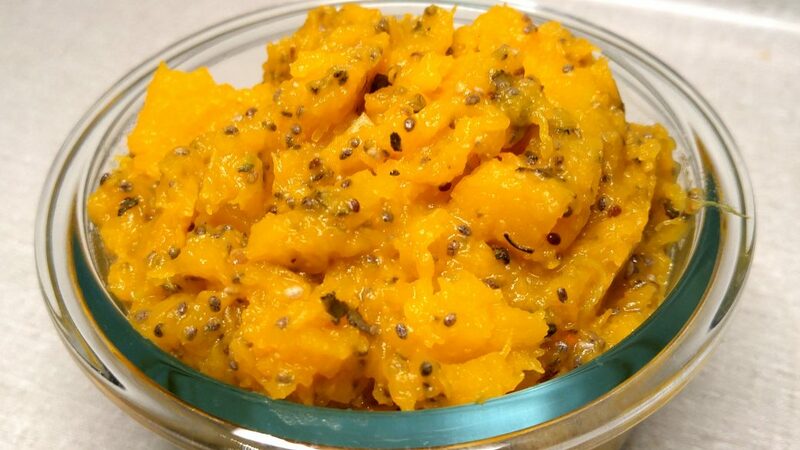 After the squash is fork tender, move to a large bowl and combine the garlic, sage and chia seeds. Roughly mash with a fork.